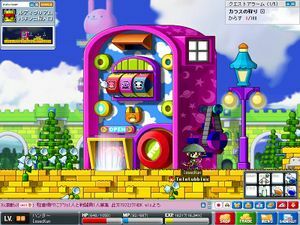 There are a number of Mini-Games in the world of MapleStory. Some are accessed via the Cash Shop, while others can be made by collecting items in-game. Most don't give any sort of prize, however. Not all take place between players, either, as there are some single player mini-games as well. In addition, there's a place in Henesys called "Henesys Game Park" dedicated to hosting these mini-games. Omok is a very simple mini-game. It is played between two players. One must own a game, while the challenger merely has to enter. Each player has a piece that resembles various monsters in the game depending on what Omok set is used that can be placed on the board. The goal of the game is to get 5 in a row. There are a number of sets that are possible to create, using Omok Pieces dropped from Monsters in Victoria Island and Ludibrium. All that is needed to create a game is 1 of each type and an Omok Table that is also dropped by few monsters(Stumps and Toy Trojans). To do this, take the collected items to Casey in Henesys Game Park or Chico in Ludibrium. A complete set of Omok is extremely easy to get now. It's more difficult finding an Omok board than getting the pieces. Previously, Omok pieces were somewhat uncommon drops and 99 of each type, along with the board, were needed to create a set. Talk to Casey in Henesys Game Park to make a deck. Match cards is another simple mini-game. To play, two players are needed, and one of them needs a Deck of cards. To make a deck, 100 monster cards (15 in GlobalMS, JapanMS, EuropeMS and BrazilMS) are needed. Talk to Casey in Henesys Game Park or Chico in Ludibrium to create one. Monster cards used to be extremely common in GlobalMS, so many people had decks of cards. However, cards have now become scarce. Once a deck has been acquired, the game is played in a window resembling Omok’s. At the beginning, after choosing a hard/medium/easy difficulty, the cards are revealed and flipped over one by one to be face down. Matches must be made by remembering where cards are. Every time a correct match is made, that player gets to try again until failure. In easy games, this can result in the player who gets the first turn winning before the second player even gets a chance to go. If a new player enters the room, the host will go first. Otherwise the loser of the previous game goes first. Since the owner of the game can kick people out, this method is sometimes abused to get a very high win/loss record. Games of Match Cards can also result in a tie, since points are attributed for each match made. Occasionally, guilds or other organizations will hold tournaments. Match Cards is available in every version. The typical Gachapon machine. Some Gachapons located in certain areas are specially themed to blend in. While considered a mini-game by some, it is by far the simplest. All that is needed is to purchase a Gachapon ticket from the cash shop, and then give it to the Gachapon NPC in each town. Different towns have different items available, and the same goes for different versions. Some compare it to playing the lottery, as once the ticket is handed over, a random item will be received, and Gachapon items are among the most valuable in the game. In some versions, as rates vary, players say that Gachapon tickets aren't worth the cost. In others, particularly TaiwanMS, the worthless items, like Red Potions, have been replaced by coupons that can be traded in for even rarer items. In GlobalMS, a Gachapon ticket costs exactly ($1) one US Dollar. They can also be purchased in bulk to save money; for instance, 35 tickets can be bought for 30,000 Nexon Points ($30). For a short time, there was also a Cash Shop event in GlobalMS where tickets would be given out for free with purchases of specific items. There are usually certain channels which give better items than others, especially in Cursed/Dark Scroll-filled Gachapons like those in Mushroom Shrine and Aquarium. Mushroom Shrine is currently the best Gachapon in quite a few versions, with tons of Cursed/Dark Scrolls and a Pink/Purple Adventurer Cape or a Brown Work Gloves occasionally. This Gachapon is not to be confused with the one in the Showa Sauna, which gives items of lower value. Gachapon is available in every version except KoreaMS, GlobalMS, EuropeMS. In GlobalMS, you can find The Great Gachaperriot in all towns. The Gachaperriot replaced all the Gachapon machines (which GMS had before this was added) and combined all town's rewards into one machine. Normally, different towns will contain various items specific to one machine, The Great Gachaperriot resolves that by making it so that all rewards are from the same reward pool. You can get Nebulites, items you would normally get from Gachapon and Chairs, all of which were separated into different Gachapon types before the release. If you give 20 Gachapon tickets all at once to the machine, it will turn into a Powergacha ticket. The Powergacha ticket will allow you to get a better chance of getting the more rare items inside the machine (this is comparable to the Mega Marvel inside the web-based Gachapon, Marvel Machine). In KoreaMS and EuropeMS, you can find the "Pigmy." It is like Gachapon, but it works differently. It gives different items as well. To use the Pigmy, one must buy an Incubator from the cash shop, and then feed the Pigmy NPC Pigmy treats, purchased from one of several shops, to get it to lay an egg. Hatch the egg in the incubator to receive your prize. Speak to Kedrick to reach the Fishing Lagoon map. In some versions, a Fishing mini-game is available. To play, a fishing rod, fishing chair, and bait are needed. The fishing rod can be bought from the cash shop. The chair is purchased from the NPC Kedrick, who is located in Perion, Henesys, Ellinia, Kerning City, Sleepywood, Orbis, El Nath, Ludibrium, Mushroom Shrine, CBD and Showa Town. Ironically, it is not available in the only place where there actually is water, Aquarium, with the exception of VietnamMS. Kedrick takes players in possession of the fishing rod to a special map called the "Fishing Lagoon". Bait can only be purchased every 24 hours, and bait expires after a certain amount of time. An item is guaranteed to be caught every minute. To receive them, speak to the Fishing Manager located at a desk on the same map. Small amounts of EXP can be acquired through this as well. If the user purchased VIP fishing rod, the catch rate is halved to one item every 30 seconds. On the whole, the Fishing System is not very popular among most Maplers, although for those who chat a lot with friends, it may be a good alternative to standing in a random map. Fishing System is available in all versions except KoreaMS, GlobalMS and EuropeMS. This shows the rankings for the Fishing King game. The Fishing King mini game originated most recently. It began in December, in TaiwanMS. It is a one player mini-game, but has competitive rankings. To play this game, talk to an NPC (located in different places in different versions). He will take you to a map that looks similar to Aqua Road. The goal is to hit certain monsters while avoiding others. Weapons are retained, however monsters can only be attacked Melee-style, so it's best to equip a spear or weapon with long reach. Points are awarded for hitting the goal monsters, and removed for hitting incorrect ones. They are added up and at the end a player is given a total. 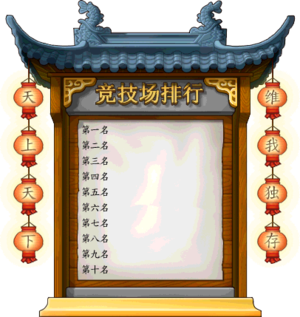 Items are awarded depending on the point total, and added on to existing totals for a high score which is placed on the ranking board. Fishing King is currently only available in TaiwanMS and ThailandMS. This Maple Admini- strator plays R/P/S. This is also a fairly new mini-game, this time originating in JapanMS. Talk to the Rock/Paper/Scissors Administrator in each town to play. This is a single player mini-game, and rewards are earned at the end. Standard Rock/Paper/Scissors gameplay applies, so Rock beats Scissors, Scissors beats Paper, Paper beats Rock, and so on. Unlike some of the other single player mini-games, there are no rankings for this game. Rock/Paper/Scissors is only available in JapanMS. This board shows PvP rankings. This is a truly unique Mini-game. It involves direct competition between players in many different kinds of head-to-head contests, some very similar to GM events. There are contests where Monsters with the opposing player's name attack, and it must be defeated before the rival does the same. There are jump quests where the goal is to race to the finish, and contests where players fight to do the most damage to the same monster. The last contest is a pure killing fest, and whomever kills the most wins. To engage in PvP battles, a ticket needs to be purchased from the Cash Shop. Also, a player can only challenge someone who falls within 10 levels, either higher or lower, from their current level. a Win/Lose record is kept and posted on an in-game rankings board. The PvP system was originally exclusively linked to the Yuyuan Garden area of China, but can now be accessed from almost every town. 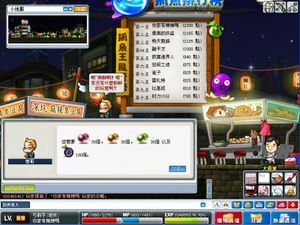 The PvP system is only available in ChinaMS and TaiwanMS. The Monster Game Arcade in Ludibrium. Monster Game Arcade is based off the real life game "Pachinko" from Japan. There are Monster Game Arcades located across the Maple World, but particularly Showa Town, Kerning City, Ludibrium, and Taipei 101 (TaiwanMS only). To play, monster game balls must be purchased from the Cash Shop. The ball is dropped into the machine and, like a pinball machine, is launched by pulling a knob. 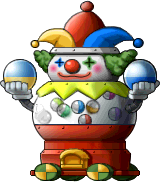 The ball bounces around and falls through a hole, where they determine prizes by which hole it falls through. Usually the prize is more balls, but these can be exchanged for other prizes, like the Jr. Cellion hat. In JapanMS, this is the only way to acquire some of these items, making them prized possessions for those capable of earning them. In real life Japan, Pachinko Houses are very popular, and because it's somewhat related to gambling, has a somewhat shady side. There are laws against Pachinko machines giving out cash, but that doesn't stop people from finding loopholes. Some even speculate it may have connections to the Yakuza, which is why the first Pachinko area in MapleStory was located in Showa Town. Monster Game Arcade is only available in JapanMS, ChinaMS and TaiwanMS. This page was last edited on 16 August 2013, at 04:07. This page has been accessed 101,827 times.